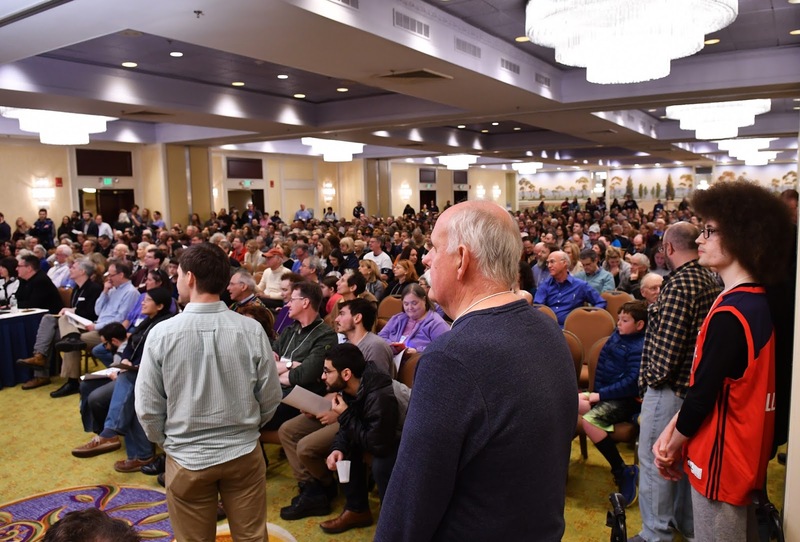 I had the great pleasure of traveling to Stamford, Connecticut this year to attend the American Crossword Puzzle Tournament. It was my fifth time competing at the ACPT, but my first since 2012, and my first time in Stamford, as my previous four tournaments were held during the Brooklyn Era. 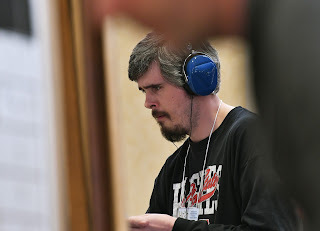 I was looking forward to seeing fellow puzzle friends and meeting many more, and to solve some fun puzzles, both during the tournament, and all of the auxiliary puzzle events going on in the hotel. The games in the hotel lobby alone are usually worth attending the tournament, and this year was no exception. The crowd for the finals. That's a lotta crossword people. My performance in the actual tournament really wasn't something I prioritized. I've never considered myself a serious speed solver, and I've certainly never "trained" for a crossword tournament. My only goal was to solve all seven puzzles clean, a feat that had alluded me in each of my previous four tournaments. Usually they were dumb, careless mistakes that were made because I prioritized speed over accuracy (except for that ARM/AIM kerfuffle from years ago - I'm still not over that one). The approach of taking the extra care to ensure accuracy, even sacrificing speed bonuses to do so, had done me quite well in last year's Indie 500, my last tournament before this year's ACPT. There I thought I was going deliberately slow - reading every clue, double-checking the grid, etc. - and I wound up 15th overall, mainly on the strength of the 100% clean solving performance. I figured this approach was as good as any other for the ACPT. My cross-country trip to the tournament went off without any hitches, and I settled into my hotel room on Friday afternoon to watch my beloved St. Cloud State Huskies hockey team once again crap out in the NCAA Tournament, this time in particularly spectacular fashion as the top seed in the country losing to a service academy. Ah, the joys of Minnesota sports. But from then on I had a blast. Lunch with top-flight solver and Aries test-solver extraordinaire David Plotkin; "Celebrity" and "Only Connect" games galore; chatting with fellow Queer Qrosswords constructors like Jenna LaFleur and Tracy Bennett and Finn Vigeland; chatting with fellow full-time puzzle writers and editors like Patti Varol and Brendan Quigley and Evan Birnholz and Sam Ezersky; meeting and chatting with Aries subscribers such as Ken Crowell, Marie desJardins, Arnold Reich, and Jesse Lansner, who would turn out to be B division solving rivals as the weekend progressed. As for the tournament, my game plan was working well through the first three puzzles. Puzzle 1 was a breeze, and I didn't have time to appreciate the theme while solving, but I did have time to check it over thoroughly. Puzzles 2 and 3 also fell quickly; in both puzzles I had left a square blank that I did catch in my post-solve scan of the grid, so again I was rewarded by taking the extra time to check. In one of these grids (I can't remember which) I had an opportunity to turn in the grid at a time close to the minute mark (if you're unaware, time bonuses at the ACPT are based on full minutes, so turning in a puzzle with 59 seconds remaining in a minute would net you the same time bonus as if you turned it in with one second remaining in the minute). Had I done so, I would have likely missed that blank square, and ended any serious chance of a finals appearance right there. Puzzle 4 seemed to emerge as the talk of the tournament, and I can see why. I had finished this puzzle and checked it over once, and then still took an additional minute afterwards to confirm that I had sussed the theme out correctly. I was confident in my submitted answer, and it was my interpretation that was initially deemed correct in an announcement from Will Shortz prior to Puzzle 5. The audible groans across the room upon Will's announcement confirmed my hunch that this would create a bit of a controversy. I want to keep the recap spoiler-free, so what I'll say is this: I think the puzzle is a terrific newspaper puzzle, but an awful tournament puzzle, and the retroactive decision on Sunday morning to give some solvers credit (based on if the judges could "interpret" if the solver fully grasped the theme) is proof that the puzzle is not a good tournament puzzle. I will stress that I believe the theme is clever and certainly the puzzle has a right to exist, but in a tournament setting, the puzzles need to have an unambiguous solution. The door was left open in this case to have multiple correct interpretations of the theme; to me, that's a failure of the puzzle. A failure that would have been a fun talker on the blogs had it run on a Thursday in the Times, for instance; in a tournament setting in which some people (not me, but still) spend a lot of time practicing and expenses to attend, I think it crosses the line into unfair territory. I was glad to hear that the judges overturned the rulings in some cases on Sunday, but at that point it was simply illustrative of the problems that puzzle created. I spoke to one solver Saturday night who was in the "I misinterpreted the theme" camp, and he mentioned the toll it took for him on the rest of the puzzles - he made careless mistakes on Puzzles 5 and 6 because his mind was still preoccupied with the Puzzle 4 fiasco. To be clear - I don't think anyone's trip was ruined or anything by that puzzle, and I still consider it to be a quality puzzle, I just disagree with its usage at a tournament. So then Puzzle 5 happens. Now, I'm sure I'm in the minority here, but I look forward to Puzzle 5. Rather than succumbing to Puzzle 5's demonic reputation, I see it as my biggest opportunity to make headway in the tournament. Most of the puzzles in the tournament are merely speed tests (and as a side note: perhaps this is easy for the 20th-overall me to say this, but I felt the puzzles this year were across the board the easiest among the five ACPTs that I have attended, and easiest by a large degree. This isn't a complaint, just an observation). Puzzle 5, on the other hand, is intended to be the trickiest, and I've always done well on Puzzle 5. I don't believe I've made an error on any Puzzle 5 that I've solved, in fact. I'll be one of the first dozen or two out of the room usually, so I look forward to 5. This year's 5 was pretty great, and while I don't think I flew through it, I got the theme relatively early and solved at a consistent pace throughout. One of the things I do in tournaments is circle the clue numbers of clues that don't make 100% sense as I'm solving. If my spidey sense goes off and I'm unsure of something, I just circle the clue numbers and make sure to focus on those entries when I'm checking the grid after I'm done. This was one puzzle were there were a lot of circled clue numbers! But everything checked out, and Puzzle 5 did for me what it usually does: it gave me a nice bump in the standings. Puzzle 6 was another speed race, and I frankly don't remember what the theme even was. All I remember was the puzzle contained the diciest entry for me all tournament (rot-13'd: [TEVBGF]. All the crossings were solid, though, and I confirmed the answer with other solvers afterwards. When the scores after 6 were posted, I was third place in the B's, trailing only Ken and Marie, and tied with Jesse, though I owned the tiebreaker at that point. Arnold was within striking distance, and so was Jeff Davidson, a phenomenal computer solver (I'm aware of sub-one minute solving times on Monday Newsdays from Jeff). Jeff had only an outside shot at this point because of his mistake on Puzzle 4. It would have taken a super-human Puzzle 7 performance from Jeff and/or mistakes by multiple solvers ahead of him for Jeff to make the finals. But if anyone could make up time on Puzzle 7, it was Jeff, and as a night owl the early Sunday time for Puzzle 7 was not going to be the ideal solving setting for me. I took comfort in knowing that, at that point, it would have to take a near-miracle for Jeff to complete the comeback. Like my game plan throughout the tournament, I went into Puzzle 7 just wanting to be clean, and that I was. I thought Patrick Berry's puzzle was the best of the weekend (shocking, I know); a tried-and-true letter addition theme flawlessly executed. There's something to be said of the classic crossword theme done this well - I'd take it over a unique-but-complex envelope-pusher any day of the week, and especially Sunday at the ACPT, apparently. The grid-spanning 21-letter entry induced an actual chuckle from me while solving, which is the crossword equivalent of a show-stopping punchline from your favorite comedian. Even seemingly more "workmanlike" theme entries (rot-13'd: [OYNAQPYNZC]) get a fantastic, minimalist clue: [Boring tool?] Ah, such a wonderful puzzle, singularly worth the price of admission - I almost regret having to solve it so quickly! Jesse reported to me right after the puzzle that he had made an error on one of the theme entries, which meant that as long as I was clean, I was likely in the finals. Arnold finished a minute behind me, I believe, so he wasn't able to make up the time difference. As it turned out, I probably should have been sweating more during Puzzle 7, because Jeff Davidson got a favorable re-ruling on his Puzzle 4, thus negating his errors and vaunting him up the B standings (CORRECTION: It was Puzzle 3, not Puzzle 4, that Jeff got a re-ruling - see his comments below. -AJR). At the final tally, I edged out Jeff by a mere five points for third place in Bs. He did make up that time by absolutely destroying Puzzle 7; had I played it extra safe and taken one more minute on Puzzle 7 (or any puzzle, for that matter), Jeff would have completed the comeback. I'm glad that I was completely oblivious to all of this until I first checked the final standings at the Newark airport hours later, as any additional pressure I would have put on myself may have caused me to make one of those dumb errors I had made at past tournaments. I had never been in the position where I was in the top 3 before Puzzle 7, so if I ever was going to solve with nerves, it was that day. But, it all turned out well in the end, and Puzzle 8 writer Sam Ezersky gave me the unofficial word in the lobby that I had survived the cut and made the B finals. I openly hoped to Sam that he had seeded his final puzzle with a Pink Floyd reference (we're both huge fans); even if not, I'm usually on Sam's wavelength on a themeless, so I was feeling confident if I did make the stage that I could do fairly well in the final. Sure enough, Will announced the finalists, and I was indeed third, about to face off against Ken and Marie on the big boards. The look of intensity. Not quite Pete Rose-intense, but close. At this point, I'm playing with house money, essentially; I didn't expect to make the finals of any division, certainly didn't expect to win anything. But now that I've made the finals, I suddenly get an odd adrenaline rush that I haven't felt in a while. If there's a competition going on, I'm going to compete, and I'm a competitive person by nature. The B and A finalists were led down to the basement while the C finals commenced, and I was talking strategy with the other finalists. I had big board experience in the past at the Minnesota Crossword Tournament, and had bombed miserably during both of those finals. 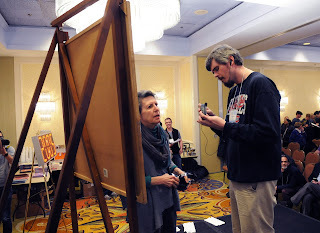 Solving on a giant board while standing up, holding the clues in one hand and writing with a marker in the other is a very unnatural thing to do, and I never got the hang of it during the Minnesota tournaments. But I'm glad I had that experience of solving that way before this ACPT performance, as the awkwardness only reduces after you solve in those situations. 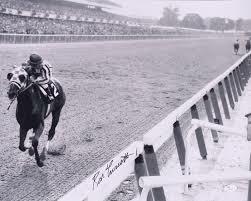 Ken and Marie both had time advantages over me, so I started ten seconds behind when the B final began. As I flipped over my clue page, I looked at the first 5-10 clues in the top left and was stumped. Couldn't get anything. Now of course I'm panicking a little, and the ugly memories of those Minnesota tournament finals came flooding back: Oh no, is it happening again? Out of frustration I moved to the top right corner, where I got the 11-Across answer, and from that point on, I felt like everything clicked. Made steady progress through the right half of the grid, then the southwest, before heading back to that initial top left corner which had thoroughly stumped me off the bat. Right around this time I saw out of my peripheral vision that Marie (solving in the center) had finished. If she was clean, she had won. But I've seen errors on the big board before, so I kept chugging along, and eventually the last corner fell, I'd say about a minute after Marie had finished; Ken was still solving when I had completed. In the end, all three of us solved cleanly, so the order of finish was the final order: Marie taking the title, yours truly in second, and Ken in third. 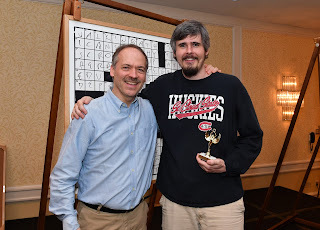 Area man (left) and 2018 ACPT "B" Division 2nd Place Finisher Andrew J. Ries (right). I didn't have a lot of time to soak in the weekend while still in Stamford; I had a rental car to drive to Newark and then a couple of flights to catch. Everything went off without a hitch until United decided to putz around on the tarmac at SFO, and somehow I missed my connection back to Oregon (also a United flight). Zero weather, mechanical issues, gate issues...no apology, for that matter, or even an acknowledgment of any mistake....long story short, it'll be the last time I fly United. But I play it spontaneous and decide to lemonade my way out of a lemon situation. I'd never been in San Francisco before - never stepped foot in California, for that matter. United's incompetence spanned many levels - uncoordinated shuttle buses and worthless food vouchers were the least of the inconveniences they hurled at me Sunday night - but there are far worse places to be marooned for twenty-four hours, and as it turned out I essentially parlayed my $150 prize for 2nd place in the B division into a day trip to Carmel and the Monterey Coast, after the expenses it cost me to get there. Sitting on Pebble Beach watching the sun go down on the Pacific was a pretty good way to wrap up the long weekend. Prett-tay, prett-tay good. A review of the ACPT wouldn't be complete without mentioning the big winner, and Erik Agard's performance this year was truly one to behold. I had the pleasure of watching Dan Feyer's first four titles in person, and I doubted if I would ever see someone more dominant than Dan in his prime. Tiger-on-a-Sunday dominant. Well, I can safely say that Erik's performance was the most convincing finals stage appearance in the tournaments that I've attended, and talking with more long-time ACPT veterans, that may have been the most impressive tournament in ACPT history. My B finals appearance earned me a promotion into the A division; watching Erik utterly obliterate his fellow stagemates - no slouches themselves, Messrs. Feyer and Plotkin, verily - gives me little reason to think I'll ever see the stage again until I phase back into a B after seven tournaments. But that's nitpicking - it's a treat enough to watch such high-end talent on display. I for one am interested to see what appears to be an elite collection of high-end A talent duking it out for the next several ACPTs. Legends like Dan and Tyler Hinman (4th overall this year) are still prime threats, and then you've got solvers like Francis Heaney and Joon and Stella not making the stage for the sole reason that this field is so stacked. Anne Ellison sat out this year's tournament, for crying out loud. We are witnessing a great era in speed solving to be sure. That's it I guess - 'til next year! One last thing - I co-hosted a college hockey podcast for the last few years, and on the last episode I discussed the ACPT for a couple of minutes at the end. The majority of the podcast is college hockey-related, and I realize the Venn diagram overlap of "Crosswords" and "College Hockey" is razor-thin, but if you're curious to hear me talk about a bit of my ACPT experience, the crossword chatter starts around the 1:04:30 mark at the link below. P.S. Here's the B Finals video. Ken on the left, Marie in the center, and yours truly on the right. Thanks to Matt Ginsberg for recording, and to Jeff Davidson for alerting me to the video. it was a pleasure to sit next to you for the first day! congrats! Likewise! Congrats on your finish - looks like you'll have a great shot at the stage next year! It's interesting to hear how taking a more careful approach seems to have helped your scores. It's something I'm finding true for me as well, as I get pretty reckless when I try to focus too much on speed, so I tried to take a similar tack overall this year. In case you were wondering what was going on with my scores towards the end - I actually didn't end up getting credit for Puzzle 4 as I wasn't perfectly consistent in my interpretation. (I might have caught it had I spent another minute checking - more evidence in favor of the benefits of slowing down). However, I did have a letter marked wrong in puzzle 3 that, as it turns out, was an acceptable variant for both clues in both directions (rot13: PUVINERR naq CNPUN, engure guna FUVINERR naq CNFUN), so I got a bump from that on Sunday morning when they granted credit. I was a bit surprised not to find anyone else who did the same thing! Great writeup, Andrew, made me feel like I was there! Congrats on your awesome performance. And as you alluded to, and as Trip said to me when I was in the B finals, welcome to the A ghetto. :-) - Anne E.
Was glad to catch you for a few words post-puzzle 7 on Sunday and especially grateful for this recap -- after my rookie year there's a lot here I identify with and found it super helpful, as well as just a joy to read. Thanks Matt - it was a pleasure meeting you as well!